Pal vazhakka / kaai curry / plantains cooked in coconut milk is a malabar special dessert which is traditionally prepared in special occasions especially during ramadan. Plantain and coconut milk recipes are good during the holy month of ramadan and so most of us prefer this dessert for athazham (eating something before sunrise for fasting). This dessert tastes really delicious with all the goodness of coconut milk. Here the term paal refers to coconut milk and vazhakka refers to plantain. This recipe is super easy and quick. Malabar dishes and malabar recipes are very famous these days. As am from malabar region, i prefer posting more traditional and authentic malabar recipes in my blog. 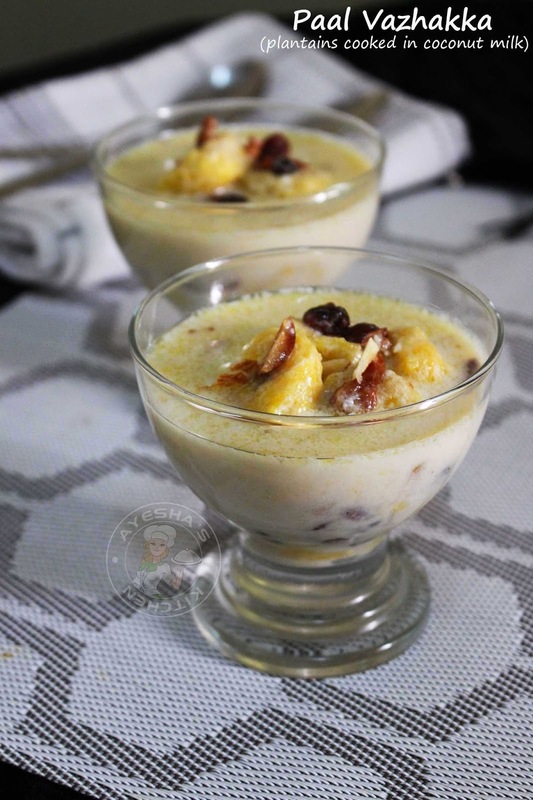 This malabar dessert is simple but delicious preparation with easily available ingredients. Ripe plantains (yethakka or nenthrapazham) and coconut milk along with nuts and other ingredients together makes this blissful yummy treat. Do enjoy this simple coconut milk plantain recipe. This is an healthy snacks for kids as they love something sweet in the evening especially for school going kids. Coconut milk is one of the versatile ingredient in our pantry. I always prefer fresh coconut milk which adds a special taste and flavor when added to desserts, curry recipes, or any food recipes. You can turn coconut milk into delicious healthy meals by adding them in smoothies, curries, soups, sauces and like so. 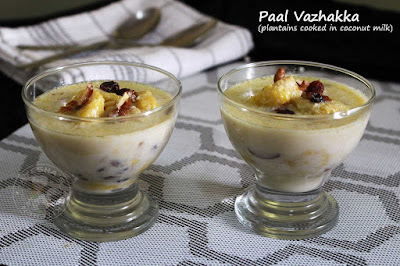 So lets see how to make paal vazhakka / ramadan recipes for iftar /kerala recipes/ healthy easy recipes/ easy dessert recipes /coconut milk desserts recipes / coconut milk drink recipes. Traditionally this kai curry (paal vazhakka) is prepared by boiling the finely chopped ripe plantain in milk. But some people dislikes that mushy creamy plantain. So i prefer cooking ripe banana separately and then chopped or sliced and finally added to hot milk. Cook the plantain with required water. Cook until done and drain it. Once cooled, chop or slice them finely. I just roundly sliced. Set aside. Boil milk in a pan and once it starts to boil, add sugar, cardamom powder and boiled sliced plantain. Mix well and then add salt to balance the taste. Combine well and let it cook well in milk. Once it becomes thick, add the thick coconut milk. Mix very well. Do not allow it to boil after adding coconut milk. So remove from flame before it starts to bubble. Heat a pan with ghee. Add finely chopped shallot. Saute for a while and then add nuts , raisins (and crushed cardamom only if you are using this instead of cardamom powder). When done, pour it over the prepared milk plantain mixture. Mix well. The consistency must be semi thick. Once cooled, it becomes more thick. Serve warm or refrigerated. Yummy.